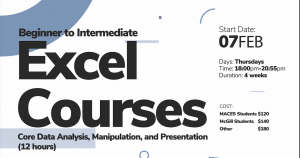 Successful attendees will have a fundamental understanding of the Excel environment and they will know and demonstrate the correct application of the principal features of Excel. Attendees will create and edit a workbook with multiple sheets, and use a graphic element to represent data visually. Workbook examples include professional-looking budgets, financial statements, team performance charts, sales invoices, and data-entry logs.